Workboats depend on reliable sources of both. To that end, the basic keys to crew comfort are both manifested in Dometic’s newest equipment offerings. As the New Year kicks off, marine equipment OEM Dometic has unveiled two new, completely upgraded offerings. The Sea Xchange CX Watermaker, a variable capacity system that can produce between 8,000-40,000 gallons per day (GPD) of potable water, is intended for a wide range of commercial applications, including on offshore platforms, floating production storage and offloading (FPSO) facilities, workboats and military vessels. Separately, Dometic has also introduced the Dometic Titan Chiller, a 45-ton unit with revolutionary new titanium coaxial tube condenser. The chiller, custom designed by Dometic and built for a 50-meter project, represents a giant leap forward in improving the longevity of its chilled water system condenser coils. The coils in the new chiller are made of industrial-grade titanium, providing captains and crews with a unit that is virtually immune to erosion and corrosion. The product announcements come at a time when workboat operators everywhere are looking to cut costs in an increasingly challenging business climate, while, at the same time, provide the best in possible accommodations, creature comforts and adherence to domestic and global habitation rules. Fortunately, the new equipment promises to satisfy all of these demands – and more. 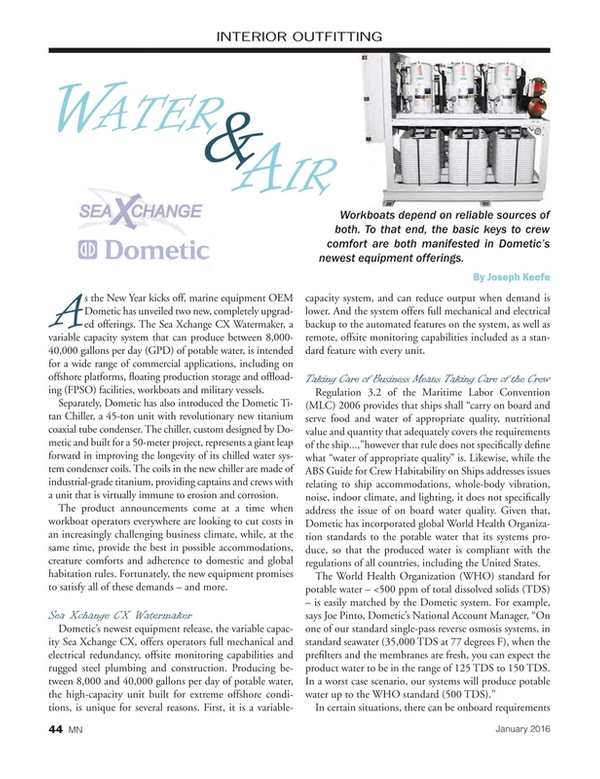 Dometic’s newest equipment release, the variable capacity Sea Xchange CX, offers operators full mechanical and electrical redundancy, offsite monitoring capabilities and rugged steel plumbing and construction. Producing between 8,000 and 40,000 gallons per day of potable water, the high-capacity unit built for extreme offshore conditions, is unique for several reasons. First, it is a variable-capacity system, and can reduce output when demand is lower. And the system offers full mechanical and electrical backup to the automated features on the system, as well as remote, offsite monitoring capabilities included as a standard feature with every unit. Regulation 3.2 of the Maritime Labor Convention (MLC) 2006 provides that ships shall “carry on board and serve food and water of appropriate quality, nutritional value and quantity that adequately covers the requirements of the ship...,”however that rule does not specifically define what “water of appropriate quality” is. Likewise, while the ABS Guide for Crew Habitability on Ships addresses issues relating to ship accommodations, whole-body vibration, noise, indoor climate, and lighting, it does not specifically address the issue of on board water quality. Given that, Dometic has incorporated global World Health Organization standards to the potable water that its systems produce, so that the produced water is compliant with the regulations of all countries, including the United States. In certain situations, there can be onboard requirements for so-called ‘technical water’ (for boiler feed water, for example). In these cases, customers require technical water which has a much lower TDS level than standard potable water. This ultra-low level of TDS can be achieved through the implementation of a second pass of reverse osmosis processing in conjunction with engineered feed water pre-treatment and possibly post-treatment, depending on the customer’s particular application. This second pass removes between 90 to 95% of the TDS from the watermaker’s product water. Dometic’s systems are specifically able to achieve this ultra-low level of TDS required of technical water if this is specified by the customer. CX systems include the industry’s 316SS passivated motor mount isolators, which properly support the high pressure pump during operation, thus minimizing system vibration. Properly placed vibration isolators minimize system vibration and result in noise reduction and increased crew comfort. For the thrifty workboat operator, the CX watermaker can also reduce output when demand is lower. Beyond this, operators have the ability to program the system to make a certain number of gallons and shut off, or run for a certain period of time and shut off. The CX systems, fully automatic, also have mechanical redundancy. “This feature makes our reverse osmosis systems unique in the marketplace, since no other manufacturer of reverse osmosis systems offers this,” adds Pinto. Consistent with today’s increasingly connected seagoing operations, the CX units come with remote, offsite monitoring capabilities. Joe Pinto explained, “We can monitor virtually all functions of the CX systems in that all system data is available. So, for example, we can look at a system fault history from the factory while a technician is physically in front of the unit to assist the technician in diagnosing a potential problem or other issue.” The system can even be operated remotely in this manner, so the customer doesn’t necessarily even need to have an onboard system operator. Another place where customers can save money is through the use of Dometic’s super-duplex, radial axial high pressure pump that is highly resistant to the effects of seawater. There is an 8,000 hour service interval on the pump, significantly longer than the service interval of the traditional piston pumps used by some of the other brands of watermakers. A high-capacity unit, built for extreme offshore conditions, the Dometic CX notably utilizes a piping system comprised of 100 percent 316SS plumbing as opposed to plastic plumbing. Pinto explains why. “Our CX systems are plumbed completely with 316SS, unlike the other reverse osmosis systems offered in the marketplace (which use plastic plumbing on the low pressure side of their systems). The challenge with plastic plumbing is that when it is exposed to weather, the material typically fatigues over time, ultimately causing plumbing to leak and ultimately rupture.” Beyond this, he insists, compared to overall system weight, the 316SS does not add a significant amount of weight. That system is plumbed with Victaulic’s “Vic-Press” plumbing system with 316 Stainless Steel Schedule 10 Pipe. Simply described, Vic-Press is a Press-to-connect piping solution offering hand-held, flame-free welding alternative installation of small-diameter stainless steel pipe in seconds. Rated for up to 2500 psi, Dometic’s CX typically operates at less than 900 psi. And, the savings in the elimination of hotwork, permits and labor alone are enough to justify the use of a better product, says Pinto. If crystal clear water is a definite requirement of a fully MLC compliant vessel, then the other side of the equation arguably includes the right to work in a comfortable environment. That wasn’t always the case, and in many instances in the past, air conditioning was installed chiefly as a function of keeping the ever-growing list of electronic equipment that over time was being retrofitted onto the standard bridge layout. That’s still important, of course, but a concerted effort to embark and keep the best possible mariner has led to an improvement in the way chillers are deployed, their capacities and greater attention given to aftermarket service. To that end, Dometic’s custom designed Titan Chiller is intended to satisfy those demands and a lot more. Central to the new design are the coils in the new chiller which are made of industrial-grade titanium, providing captains and crews with a unit that is virtually immune to erosion and corrosion. Debris from invasive marine life has been increasing considerably in recent years, causing serious issues with yacht and superyacht chillers. Dometic studied this problem extensively and found that the common methods used to battle it, such as acid cleaning and higher water velocity, were detrimental to cupronickel tubing. Therefore, Dometic developed the Titan Chiller, which uses titanium tubes that can easily withstand these cleaning methods. The robust Titan Chiller Titanium condenser comes with a limited 5-year warranty, and a maintenance schedule that promises low cost of ownership, in exchange for a minor increase in price. And, as of January 2016, the Dometic Chiller only uses new titanium coaxial tube condensers as opposed to Copper-Nickel The Dometic approach costs 3 to 4 percent more, but also results in a weight savings of 8 to 10 percent, depending on the size of the system. The Dometic Chiller is built exclusively for harsh on board environments, built for purpose and also built-to-fit hard to access spaces – like the conditions found on some workboats, for example. And, the system is scalable – up and down – for a myriad of workboat applications. With the coaxial setup, for example, the system can go all the way up to as much as 75 tons. Haynes adds, “There’s really no limit to what we can provide. We do a lot of tugs; anywhere from 15 to 25 ton chillers.” Current commercial maritime clients and customers who have bought previous versions of Dometic watermakers include Signet Maritime, Metal Shark, the U.S. Coast Guard, Harvey Gulf, Nichols Brothers, Metal Shark, and many more. For workboat operators watching the bottom line and the welfare of their crews at the same time, water and A/C are probably two things they don’t want to worry about. Now, they don’t have to.